The nominees for the 2018 Emmys have been announced! 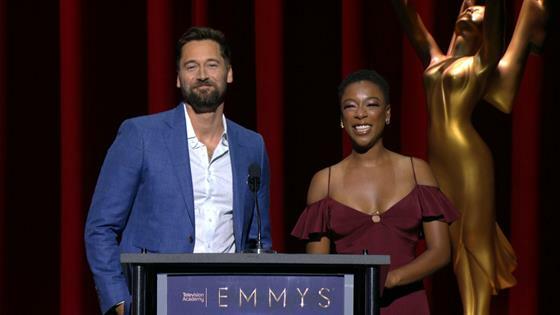 On Thursday morning, Handmaid's Tale star Samira Wiley and NBC's New Amsterdam star Ryan Eggold jointly announced the award show nominees live from the Wolf Theatre inside the Television Academy's Saban Media Center. During the announcement, Wiley found out that she herself had been nominated for Guest Actress in a Drama Series for her work on The Handmaid's Tale. Among the other notable nominees is Killing Eve's Sandra Oh, who on Thursday became the first Asian woman to be nominated for Lead Actress in a Drama Series. The Sinner star Jessica Biel scored her first Emmy nomination on Thursday when she was nominated for Lead Actress in a Limited Series or Movie. Take a look at the gallery below to see all of the notable nominees! You can see the complete list of 2018 Emmy nominations HERE. Watch the 2018 Emmys on Monday, Sept. 17 at 8 p.m. ET/5 p.m. PT.